Welcome to Premier Builders, with over 40 years’ combined experience within our team, we specialise in the placement of reinforced concrete for all sectors of the construction industry. Through a focus on quality workmanship and exceptional health and safety, we provide domestic and commercial customers with a wide variety of first class concrete constructions. No matter what the size of project or requirements, we are confident in our experienced and highly skilled team’s ability to provide the solution. We have established a long lasting and strong relationship with both our suppliers and these links allow us to utilise the very latest equipment to complete our commercial reinforced concrete projects resulting a faster turnaround and an enhanced level of customer service. Our excellent reputation and list of satisfied clients is something in which we take great pride. We offer the opportunity to benefit from a level of superior workmanship in our field and a guarantee of a high quality, durable finish for any project. 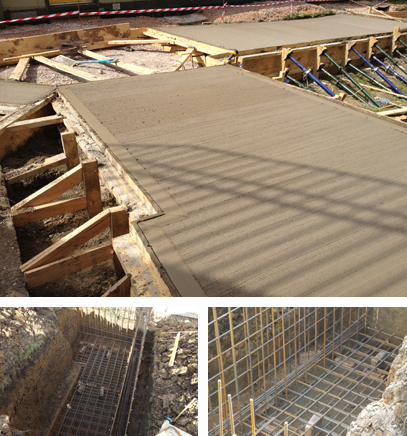 We aim to supply the best, most professional service available in the reinforced concrete structures sector available in the Surrey/London area and will complete all aspects of the initial ground works including excavation and site strip. We work on both Civil and building contracts and will submit quotations for live and tendered contracts. With our experienced and committed workforce using a variety of tried and tested techniques, we are ideally positioned to offer our clients a fully integrated approach to any project.